Polynomial hashing as an instantiation of universal hashing is a widely employed method for the construction of MACs and authenticated encryption (AE) schemes, the ubiquitous GCM being a prominent example. It is also used in recent AE proposals within the CAESAR competition which aim at providing nonce misuse resistance, such as POET. 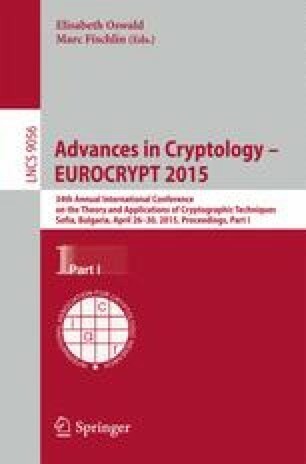 The algebraic structure of polynomial hashing has given rise to security concerns: At CRYPTO 2008, Handschuh and Preneel describe key recovery attacks, and at FSE 2013, Procter and Cid provide a comprehensive framework for forgery attacks. Both approaches rely heavily on the ability to construct forgery polynomials having disjoint sets of roots, with many roots (“weak keys”) each. Constructing such polynomials beyond naïve approaches is crucial for these attacks, but still an open problem. In this paper, we comprehensively address this issue. We propose to use twisted polynomials from Ore rings as forgery polynomials. We show how to construct sparse forgery polynomials with full control over the sets of roots. We also achieve complete and explicit disjoint coverage of the key space by these polynomials. We furthermore leverage this new construction in an improved key recovery algorithm. As cryptanalytic applications of our twisted polynomials, we develop the first universal forgery attacks on GCM in the weak-key model that do not require nonce reuse. Moreover, we present universal weak-key forgeries for the nonce-misuse resistant AE scheme POET, which is a CAESAR candidate. Due to page limitations, several details are omitted in this proceedings version. A full version is available at .